Feather tattoos can have many different meanings, and people get them for a variety of reasons. Every tattoo means something different. And whether it’s a tribute to someone in your life, a symbol that is meaningful in some way, or just a design that you found to be attractive, there is almost always a specific reason behind a person’s choice to permanently ink their skin. One such meaningful tattoo might come in the form of a beautiful feather tattoo. Whether it is a colorful feather or a more simple feather in black and white, there is often some level of significance behind these kinds of tattoo designs. Easily one of the most popular tattoo designs, feathers have a lot of symbolism behind them, but many people don’t realize it. If you’ve been thinking of getting a feather tattoo, whether it is a big, sprawling back tattoo, an arm sleeve, or just a cute small tattoo behind the ear, you might be interested to learn a little bit about the various meanings behind this popular tattoo idea. First, how much is a feather tattoo? That greatly depends on how intricate or simple the design is, as well as the size of the tattoo. If you get a large colorful feather tattoo for example, it will likely be a lot more than a small simple feather tattoo. An obvious meaning behind a feather tattoo, the desire for freedom prompts many people to get this design etched onto their skin. Bird feathers symbolize spreading your wings and taking off, no matter if you can see the ground or not. You might hear a lot of people who get these types of tattoos calling themselves free spirits or wanderers, because they long for emotional, mental, and physical freedom. A tasteful bird feather design can be a subtle way to express this kind of spirit of longing, rather than through actual words or a full bird tattoo. Historically, different cultures have been known to sport feather tattoos as a sign that they have a close relationship with Spirit, Source, the Universe, or whatever you’d like to call it. Specifically, Native Americans, Egyptians, and Celtics wore feather tribal tattoos as a symbol of their connection to nature, and the various gods they believed in. These cultures have a close relationship with the Earth, and therefore, this tattoo allows them to depict that connection on their own skin, further deepening this bond between human and Earth. 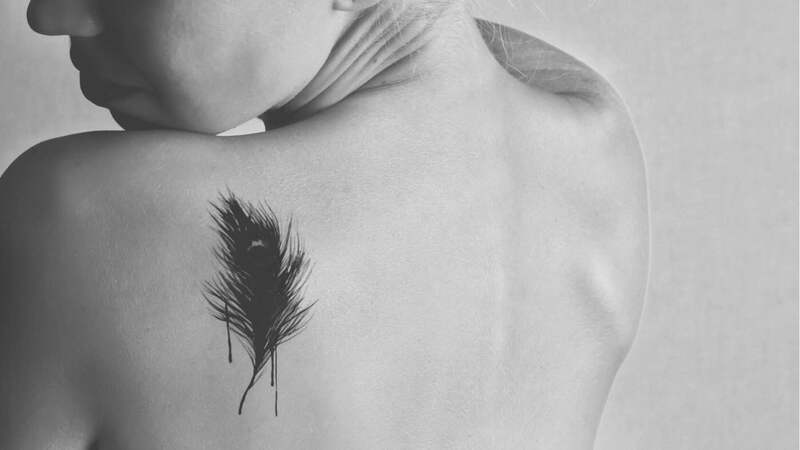 Feather tattoos can also be a sign of boldness, assertiveness, and courage. If you look at it symbolically, birds have the courage to spread their wings and fly, and trust themselves enough to not fall. So, in the same way, people who get feather tattoos have great strength and faith in themselves to make the right decisions in life, and soar rather than fall. Sometimes all it takes is a beautiful feather in a prominent place, to remind you of the courage that you have inside. People who get feather tattoos likely have great intelligence, as feathers have an association with air, and people born under an air sign excel in intelligence and communication. They express themselves clearly and know exactly what they want in life, which persuades them to get a feather tattoo. Also, many animals with feathers have great beauty; for example, owls, peacocks, and doves. If you choose to get a feather tattoo — especially a bird tattoo — this symbolizes regality, poise, and beauty. You might look at various birds in bewilderment, and really feel a connection to how they carry themselves in nature. If you get a feather tattoo, this will serve as a constant reminder of how truly breathtaking this world is. It is for this reason that bird feather tattoos such as eagle feather, peacock feather tattoos and owl tattoos are very popular. Especially in the Native American culture, birds are seen as sacred, wise creatures that deliver important messages and directly embody Spirit. Native Americans believe that all animals and plants carry the Source Energy through them, but birds are seen as special spirit guides, showing them the right path in life. So, you might choose to get a feather tattoo as a connection to your culture, as well. It is also worth noting that the location of tattoo designs can alter their significance slightly. For example, a small feather tattoo behind the ear might mean something more intimate than, say, a simple feather on the arm. If you are looking for inspiration for your large or small feather design — or even for tattoo ideas in general — you can find countless tattoo ideas online to spark something creatively inside of your mind. If you’d like to read more about the meaning behind tattoos, you can read our article about semicolon tattoos here.